The love child of owner/operators Luke Mutton and Kylie Mackinlay (also of South Melbourne's Deadman Espresso), Common Galaxia has finally opened its sleek sliding doors following a six-month collaboration between Mutton and local designers and suppliers – a marathon pursuit in design perfection. All furniture and fittings are custom made for the best in form and function – the triangular steel cutlery holders that swing from each table are pure genius, and the shape of the stool legs mirror that of the light fittings. There are terrariums – enough said. At the central coffee bar a shiny Synesso pumps out a Seven Seeds blend, Market Lane single origin, or special guest roasts – your choice. Avocado, pomegranate and pistachio on toasted pumpkin bread is a refreshing twist on an old favourite. Baked zucchini fritters are little pucks of green goodness, served with house-smoked salmon and a slow, slow, slow poached free-range egg. Nearly every menu item has bacon as an optional extra – of this we could not approve more. 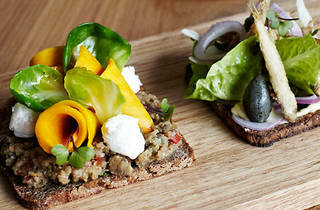 Lunch is a selection of smørrebrød – five different Danish-style open-faced sandwiches on rye. Go for the namesake sandwich Common Galaxia. Fried whole whitebait, (thankfully not fished from the Maribyrnong) sit atop rye toast with crisp cos lettuce, lemon mayo and finely sliced spanish onion. 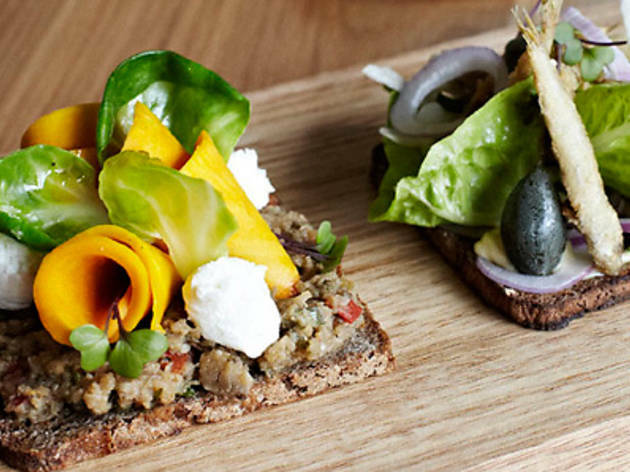 A vego option of oil rich eggplant puree and bitey pickled pumpkin has a good balance of flavours. At the princely sum of $8.50 each we suggest you try a couple. It may be named after an innocuous little white fish from the nearby Maribyrnong River but this venture is more Scandinavian supermodel than wet fish, and right now, it’s the hottest piece of café action in the west.